I forget sometimes that security cameras (real or fake) are meant to look mean, like those that point down at drivers all over Boston these days. But hanging off of one of the saltbox houses in my Milton neighborhood, a gray CCTV-type camera looks trashy. 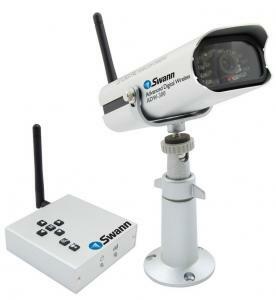 The Swann ADW-300 is disappointing for this reason, and one other: It doesn't do Macs. The 2.4GHz ADW-300 (ADW stands for "Advanced Digital Wireless") transmits a wireless signal to a receiver box. The ADW-300 is super-easy to use with TVs and computer monitors, as well as recording equipment -anything that has standard AV jacks. It also picks up sound. The ADW-300's range from camera to receiver is about 160 feet, making it perfect if you live upstairs in a double-decker and receive a lot of packages, or if you need to keep an eye on the action in your backyard (presuming you have a small yard like mine). The ADW-300 (which is expected to retail for about $200) also works with PCs via USB, but not Macs. In my little world, that's a deal-breaker. Further augmenting the AD-300's menacing looks are the warning stickers you are supposed to put in your window, once you've set the camera up. "FIRST Lego League: The Unofficial Guide" (by James Floyd Kelly and Jonathan Daudelin; about $30 at www.nostarch.com) will engage young roboticists - and the moms and dads who shuttle them to competitions - in much the same way. Kelly and Daudelin are themselves veteran Lego roboticists inspired by the work of New England inventor Dean Kamen, who started the nonprofit FIRST (For Inspiration and Recognition of Science and Technology) in 1989. There are now 100,000 students in the league, Kamen writes in the introduction. The Lego league guide treats young readers (only 9-to-14-year-olds can compete) with respect, with chapters that will help them develop their organizational and leadership skills. The second half of The Unofficial Guide is for coaches: That is where Kelly and Daudelin cover building techniques and Lego Mindstorms NXT programming in some detail. I'm no hard guy -not even close. But I like to play one at Curry Hardware in Quincy, where I typically show up wearing a tape measure on my belt, and with smart questions, informed by hours searching DIY websites and watching "This Old House." Last week, I added the new Rugby (about $130 with a 2-year AT&T contract) to my act. Also known as the Samsung SGH-837, it's a 3G flip phone for people who truck their lunches around in beer coolers. The Rugby is rugged enough. It is made to military specs to withstand extremes of shock, rain, heat, and high alitudes - meaning it can take a heck of a lot more than me. When closed, the Rugby looks like a DeWalt toolbox. It comes in black, and black-and-yellow. You can also special-order the Rugby in magenta. My brother-in-law, Mike, a general contractor (and the next Thomas J. Flatley, if you ask me), enjoyed looking over the Rugby at his dad's North Falmouth home recently. Push-to-talk? Check. Speakerphone? Check. Hard case? Check. The Rugby's 1.3-megapixel camera is a weak point. Mike said he'd like a better-quality camera to document jobs for customers and inspectors. Mike was also unimpressed by a hook on the top of the Rugby, for which he saw limited use. "All that looks good for is digging into your thigh," he said.